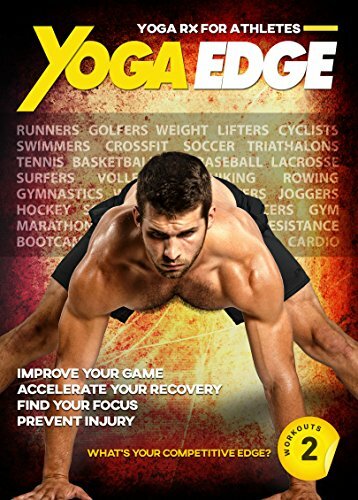 Yoga Edge is a supplement in workout form, designed to help you train better, perform better, recover better, and feel better. This is yoga for those who don't normally do yoga. This is yoga to help you make progress on your days off to get the most out of your current exercise plan. Created for avid runners, competitors of all types, and anyone who works out. You'll be able to increase power, strength, and mobility as you soothe sore muscles, protect your joints, relieve pain, and enhance your recovery. Tackle every workout with renewed energy! Inside, you'll get access to two easy to implement sessions perfect for rest-days and post-workouts that are just 25 min long. You'll also get a special matrix that allows you to select the yoga exercises best suited to your sport. Strengthen your knees and ankles to run faster, longer, and smoother. Improve muscle activation in your glutes for more explosive squats. Increase rotational strength for more powerful throws and swings. Build core strength and improve hip flexibility to strengthen your lower back. Improve your range of motion for more power in your lifts, runs, and sprints. Increase body control and balance for quicker changes of direction. Whether you're simply hitting the gym to get into shape, competing as part of a team, or training for race day, you'll be able to achieve your goals sooner, safer, and with less chance of injury while feeling refreshed, rejuvenated, and ready for more. Featuring chief yoga beast, Dean Pohlman, you can expect a fitness, anatomy-based approach to yoga without the traditional yoga lifestyle. No painful postures. No hymns, chants, or gongs. It's the missing piece of the puzzle to your existing training regime. Take your game to the next level and get the confidence you need to push yourself to the limit without the fear of injury. If you have any questions about this product by Body By Yoga, contact us by completing and submitting the form below. If you are looking for a specif part number, please include it with your message.